We have less than 5 months to a General Election in the UK in May 2015, yet our political system is in severe crisis and our mistrust of politicians has never been greater. TheCoalition in its term of office has managed to hoodwink the general populas into believing the rhetoric bellowed out daily by one minister or another . All government departments have come in for some critical analysis but one stands out above all the rest than the Department for Work and Pensions and the ministers running it. Head Honcho Iain Duncan Smith and his cohorts have mislead the population with lies and statistics and scaremongering stories in the National Press and Media which, for the most part they control like a well oiled machine of propaganda fuelled by a twisted ideology that the working classes are to blame for the countries woes, yet when the real truth is it was a global banking crisis that got this country in a mess not the working man. 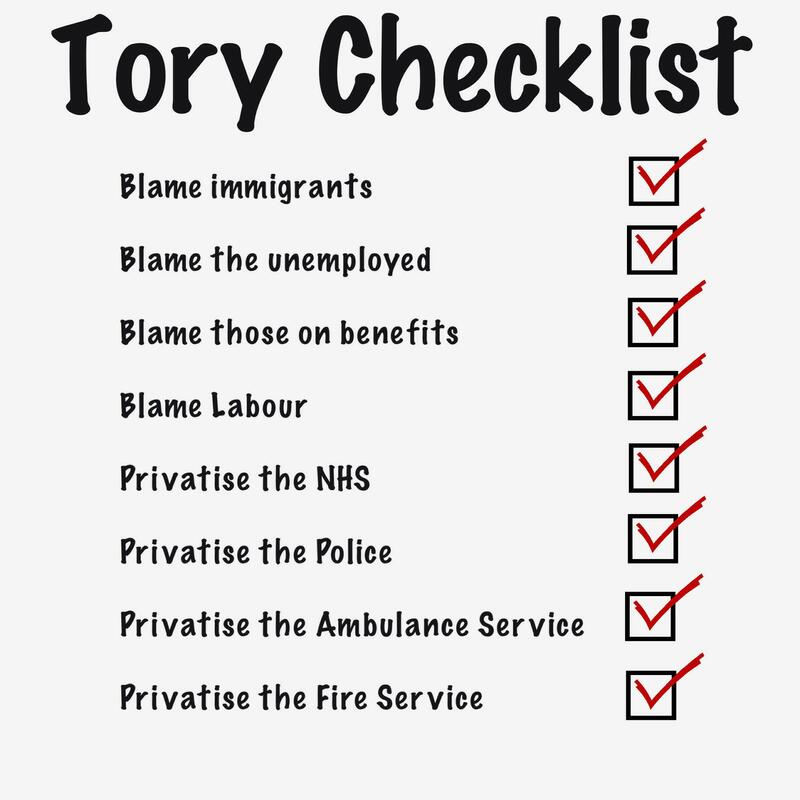 This is long held tory ideal of blaming the poorest in society, rather than those at the top running the joint while the elitist 1% filled their pockets with glee while avoiding paying their taxes wherever possible. Many Campaigners such as Disabled People Against the Cuts and sister organisation Black Triangle, Boycott Workfare, UK Uncut, Occupy, Anonymous and many other campaigners such as Sue Marsh of Spartacus fame & Diary of Benefit Scrounger plus many excellent Bloggers took to their keyboards and in many cases to the streets to show their utter disapproval of the treatment dished out to those at the bottom of the ladder. Benefit Claimants became the thing to be hated and despised and punished by the establishment and the public in equal measure, sucked into the Blame Game carefully orchestrated by the coalition government pre election and post election. Media Blackouts carefully done by those in National Press whom many are Tory donors and the Murdoch empire spun into action to make sure their masters bidding was granted, with the exception of a few honest decent journalists and politicians trying to get the message out into the public domain, that the policies to be introduced were pushed through parliament by some unscrupulous means to satisfy public opinion who believed this rhetoric being spouted from rooftops. We have come a long way since 2010 and the Resistance has come from many forms, but mostly from those who saw it coming and watched the death and destruction & despair it has, and still is causing among the targeted groups. Non greater than Sick & Disabled people and others who found themselves in need of support from the ‘Safety Net’ put in place by Nye Bevin and the birth of the Welfare State which many have paid into via National Insurance Contributions over the years of working hard which they were told would provide for them should they fall on hard times. That was before IDS and his cohorts took office and in the short time they have been in office have almost dismantled the entire thing while the public stood by and watched from the side lines and played the Blame Game. The Game is at a critical point now and with 60% more cuts to come,those who stood and watched this happen to those at bottom of the pile ,will sure be next on the hit list we already have had Immigration dragged into the mix and many other groups in society at the lower levels of the ladder are next in the firing line while safeguarding the grey vote until they get back in to finish those off too! We have those who benefit from this right-wing fascist regime gloating about the deserving and undeserving dragging the country into the abyss and those fighting it being called the loony left apologists, we have men and women in this country fighting one another as the divide and rule tactics bed in for the fight between socialists and capitalists and the Green Party environmentalists all scrapping for pole position to save what is left of country. Never in history has there been a time to unite and throw this lot out and stop fighting each other and if we really want to save our country the ones to do so will be the public when they go out and vote come the election. The battle will be the bloodiest for centuries, the tactics employed by those orchestrating it including putting infiltrators amongst campaigners and within the communities affected so they are distracted while the devils work is completed, just like Thatcher did with the Miners and some are blinded that our government would resort to such things as lessons should have been learned, but the reality is they have not been learned at all, which gives them the power to finish our country off . We need to stay focused, root out the distractors and expose this unelected government for what it really is, that it is only looking after those who have plenty and punish those who have nothing left to lose given they have been stripped of any human dignity they had in post war Britain. It is now that ‘YOU’ stand up together shoulder to shoulder with your fellow man and say Enough is Enough and stop this madness, we are all equal in society and because you have more than your neighbour materially do not look down on them but unite together to fight what can only be called a regime funded by those with the money the 1%, against the rest of society who are all working class realistically cos you all have to go to work to put food on table and a roof above your heads.